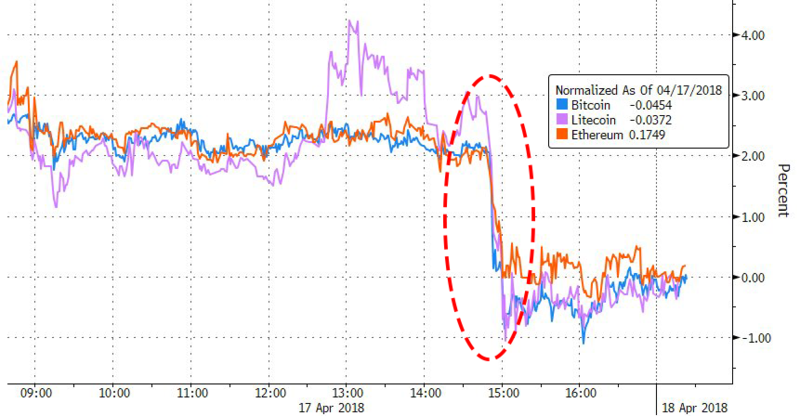 The price of several cryptocurrencies took a sudden hit Tuesday over the course of 20 minutes, which some suspect may be the result of a single Bitcoin whale who unloaded over $50 million worth of the digital currency in one Bitfinex trade. The drop comes one day after the third largest bitcoin wallet also unloaded around $50 million of the digital currency. As Marketwatch first noted , "the balance of wallet 3D2oetdNuZUqQHPJmcMDDHYoqkyNVsFk9r — an anonymous digital account which is valued at $1.49 billion — fell by 6,500 bitcoin Tuesday, with the average sale price sale being $8,146.70, a total value of just over $50 million, according to bitinfocharts." The sale comes a day after the third-largest wallet, which famously purchased over $400 million in bitcoin in February, let go of 6,600 bitcoin at an average price of $8,026. Combined, the two whales unloaded over $100 million of bitcoin within 24 hours. The crypto community was abuzz after the precipitous drop. “Holy hell, these dumps out of nowhere. I was looking at some alts, then I check back to bitcoin and BAM it dropped $200 instantly,” one Reddit user wrote. As there was no immediate news or catalyst, some attributed the sale to Tuesday's report that New York Attorney General Eric Schneiderman had launched an investigation into 13 cryptocurrency exchanges including Coinbase, Gemini and Bit Trust. The probe seeks information on fees, volume data and procedures governing margin trading among other things. However, the news hit some 4 hours prior to the sale. As we reported earlier, a questionnaire was sent to each exchange requesting information about trading policies and procedures, basic operation and fees, as well as controls to prevent money laundering and hacks. "With cryptocurrency on the rise, consumers in New York and across the country have a right to transparency and accountability when they invest their money ... "Yet too often, consumers don’t have the basic facts they need to assess the fairness, integrity, and security of these trading platforms." And as the Independent adds, although the initiative is designed to protect the interests of New York residents who trade cryptocurrency with these exchanges, the international nature of the businesses means the outcome of the probe could have wide-reaching consequences. The NY-AG investigation comes a day after IMF head Christine Lagarde said an even-handed approach is required to regulate the cryptocurrency space. “Just as a few technologies that emerged from the dot-com era have transformed our lives, the crypto assets that survive could have a significant impact on how we save, invest and pay our bills,” Lagarde wrote in a blog post on the IMF website, adding “Before crypto-assets can transform financial activity in a meaningful and lasting way, they must earn the confidence and support of consumers and authorities." As we have documented in the past, previous selloffs have also been attributed to single-user selling - with the most famous case being a March 7 "Mt. Gox" sale, first reported here, when trustees of the insolvent exchange announced the liquidation of over $400 million in Bitcoin and Bitcoin Cash.